The front page of the Internet, also known as the social news community reddit had seen its fair share of ups and downs over the years, but in September of last year, many in its community saw a silver lining when its owner, Conde Nast, spun it out as a standalone site, and recruited co-founder Alexis Ohanian to sit on its new board of directors. I’d be lying if I said that it didn’t immediately cross my mind to imagine what it would be like to do that job. I’d left my previous company (Facebook) over a year ago and been doing random startup consulting ever since … So imagine my surprise when two days later, I was contacted asking if I was interested in talking about the position … At first, I didn’t really quite believe I was a serious candidate. It didn’t seem real, and I knew that I didn’t match the profile of what you might consider (or so I thought) a CEO candidate. I don’t have the polish and the poise and the schmoozing, and I don’t play golf. The new CEO’s Facebook profile officially lists his name as Yishan “Sparklepants” Wong, so there’s little doubt that, in spite of his lacking proficiency at golf, he’ll fit right in at reddit. And while Wong may not have experience as a chief executive, Wong was formerly the Director of Engineering at Facebook, where he worked as an early employee from 2005 to 2010, helping to build Facebook’s engineering staff into the army it is today. As was first reported by Kim-Mai Cutler on Inside Facebook (soon to be a TechCruncher), he was also an early employee at PayPal, starting at the company in 2001, prior to its acquisition by eBay, through 2005, when he joined Facebook. 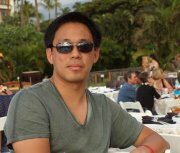 After leaving Facebook, as he says in his address to redditors, he has “been doing random startup consulting ever since.” Wong, as indicated in the headline is also an avid user of Quora, where he is known for offering some terrific, irreverent answers to the questions of the day. I’m not looking to step in and make “big, bold changes” – I think reddit is great, and the team has a lot of good features already in the pipeline to improve functionality for users and mods, help with subreddit discovery, improve the API, and help bring reddit to more people – so the primary goal for my first few months is to listen and try to learn as much as I can about the details of the product and the community. And just in case you’re wondering what the ever-active, plucky group of reddit users are saying about the new hire, you can check out their reactions here. And for more on Wong, check out his page here, and his blog post to the reddit community here.